Microsoft is stressing quick and simple with Windows Live Movie Maker that on Wednesday drops its "beta" label and is now available for general use and download. 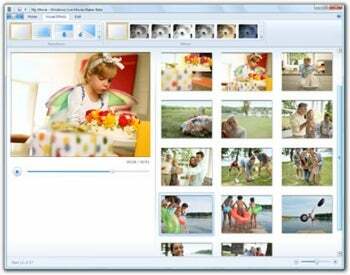 The free program, that allows you easily create movies from digital images and video clips and share them, is part of Microsoft's Windows Live Essentials suite of programs tied primarily to Windows 7. For those unfamiliar with Microsoft's Movie Maker software, it is a program most commonly used to create slideshows from digital images and short video clips. Once compiled the slideshow can be turned into a movie for burning to a DVD or sharing online. 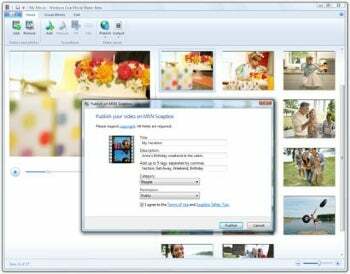 Windows Live Movie Maker competes with slideshow programs such as FastStone Image Viewer and features found in programs such as Picasa. Windows Live Movie Maker features a storyboard located in the right side of the application. You can see the tools menu ribbon above. Windows Live Movie Maker is a massive update from the previous version (Windows Movie Maker) which came bundled in Windows Vista and XP. Live Movie Maker brings a new look and features to the table such as a revamped interface that puts editing functions into a Windows ribbon (brining it in line with the look and feel of Office 2010). Microsoft has also changed the layout of the storyboard (where you create and edit images and video) putting it in the right-hand side of the software. Also new is an Auto Movie feature that automatically creates a movie from your digital images and video snippets that include titles, a soundtrack, fade transitions, and image effects. Provided you have a fast computer, the entire Auto Movie process takes about 10 seconds. New features allow you to import and combine photos, video clips, and music, and then edit your movie. With the grunt work in place, you can go back and add different transitions, rearrange the order of slides and add text overlays with transitions. Of course, any movie can be created manually, adding transitions, and pan-and-scan for each individual frame. Video clips can also now be trimmed down from within the software using a set of sliders in the player window. When the video's done, it can be saved to the hard drive, burned to a DVD, or sent to YouTube, all from within the software. HD formats of up to 1080p are supported. The idea here is to appeal to the common user, who wants to create something from a photo library without putting much effort into it. Maybe Windows Live Movie Maker's approach of creating the content first and editing the details later will give the tool more presence for Windows users, as the original Windows Movie Maker never quite took off. Here you can see the export feature that allows you to share your video to sites such as YouTube or e-mail them to a friend. The software, which was released in beta earlier this year, will be available to Windows Vista and Windows 7 users as part of Windows Live Essentials. Its introduction will compliment Microsoft's stripped down approach to Windows 7, letting users choose the software they want through a desktop link instead of pre-loading the operating system with bloatware. We'll see if Live Movie Maker's simplicity will earn more of a following than its predecessor.